After a week of speculation, Kurt Angle confirmed his opponent at WrestleMania 35 will be Baron Corbin. On the March 18 of Monday Night RAW, Angle said that his retirement tour rolls on as he has his last match in Chicago. He thanks the McMahon family for allowing him to choose his opponent at WrestleMania 35. He says that his opponent will be the man who made his life as general manager a living hell. That man is Baron Corbin. It would give Angle extreme pleasure to tap out Baron Corbin on the “grandest stage of them all” and walk off into the sunset. 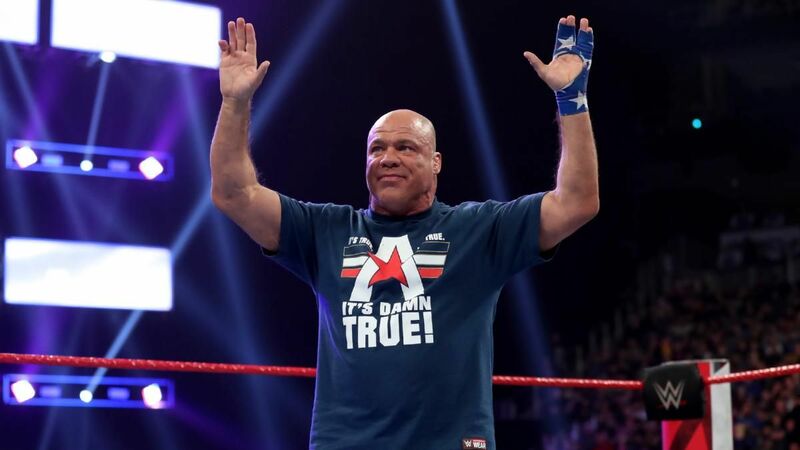 Watch Kurt Angle make his match with Baron Corbin at WrestleMania 35 official, below. Chad Gable then comes out as Angle’s opponent for the evening, who is in a singlet similar to what he would wear while a part of American Alpha. Angle defeated Gable via an Ankle Lock. After the match, Corbin comes out to say that no one will remember him just his last match, and his last match will end in a loss. Last week, Angle made the announcement that his last match in WWE would be at WrestleMania 35. At the time he didn’t reveal who his opponent would be, but in a backstage interview after RAW went off the air, the former champion listed off names he could see himself facing. This list included John Cena, Samoa Joe, Drew McIntyre, Baron Corbin, AJ Styles and Bobby Lashley. That night, Angle wrestled his last match in his hometown of Pittsburgh and won against Apollo Crews. With Angle’s match against Baron Corbin confirmed, that brings the WrestleMania 35 card – so far – to six which includes the Universal Championship match between Brock Lesnar and Seth Rollins, the triple threat for the RAW Women’s Championship between Ronda Rousey, Becky Lynch and Charlotte Flair, AJ Styles vs Randy Orton, Shane McMahon vs The Miz, and Triple H vs Batista. What do you think of Kurt Angle’s opponent? Do you think it will be a good match? Let us know in the comment section below.